Jonathan Goldman was an acupuncturist in Boston who unexpectedly found himself having a profound transformative experience in a remote Brazilian jungle, and ended up in a protracted legal struggle with the US Government over religious freedom — and won. He now practices “Transformational Energy Healing” in Oregon. In this episode of A Congruent Life, Jonathan talks about his desperate prayer as an eight-year-old boy not to be bored, missing opportunities and the power of affirming what you want, his learning that “people living authentic lives would have never predicted what their lives would look like,” ensuring that you’re not following someone else’s plan, and fear and faith being two ends of the same cord. This entry was posted in Podcast on July 31, 2013 by Andy Gray. Jonathon, how wonderful to see your face and hear your voice. As always, you become more articulate, more compassionate in your teaching. Listening to this podcast, I “time traveled” to the work and times we shared years ago. Would love to see you. 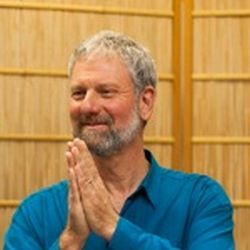 This was an excellent interview–thank you both to Jonathan for the amazing life work he has done/is doing, and the spiritual eldership that he is moving into and Andy for his heartfulness and gentle probing skills.